Our state of the art centre is based in Welling, Kent. If you would like to arrange a treatment for your pet then please get in contact us so we can help. Our qualified hydrotherapists upon veterinary referral examine and assess your pet, to build a suitable and extremely effective rehab program. We offer grooming, nutritional advice and behavioural training at our centre all carried out by qualified city & guild dog groomers and veterinary nurses. Hydrotherapy (swimming) treatment is recommended by vets to be beneficial as part of the recovery process for a variety of conditions such as arthritis, Hip Dysplasia, muscle and spinal injuries. 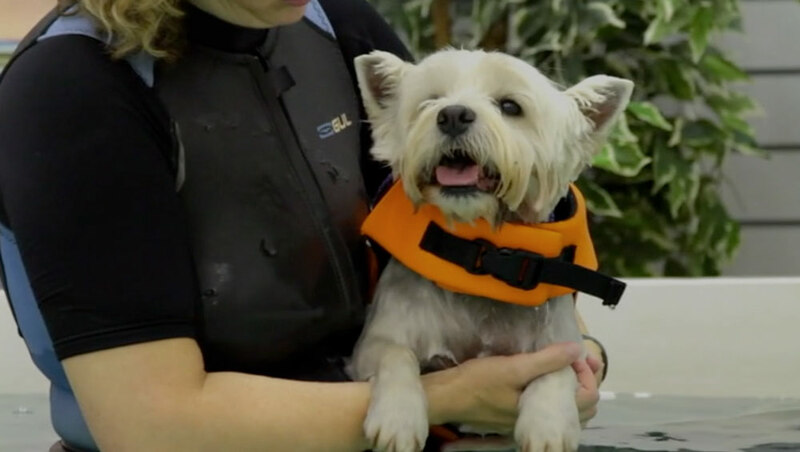 Hydrotherapy can help both physically and mentally with your pets rehabilitation. Hydrotherapy helps ease joint stiffness by offering gentle exercise in a controlled environment. Soft tissue work increases blood flow to the muscles alongside the benefits of warm water providing a relaxing environment. It also acts as a great form of exercise enhancing the dogs natural movement and body awareness . Hydrotherapy can improve the animals fitness and stamina whilst providing pain relief at the same time, and it is especially helpful if the animal is recovering from an injury or operation as it speeds up recovery after surgery. Hydrotherapy is also available for fit and healthy dogs who enjoy swimming and it is also suitable for building and toning muscles in show dogs.